Do not fail to stop at Jordan's desert castles Kerak, Amra, Azraq, Hallabat, Kharanah, and Mushatta. Widely varied in function, architectural style, and creative embellishment, such one is well worth a visit. Doted throughout the semi-arid, steppe like terrain of eastern Jordan and the central hills are numerous historic ruins including castles, forts, towers, baths, farming estates, caravan inns and fortified places which have traditionally been known as desert castles. The medieval castles at kerak and shobak, along the King's Highway, are authentic 12th Century Crusader hilltop fortresses whose galleries, tower, chapels and ramparts recall the gallantry of the Crusaders themselves. The ruins of two other Crusader castles, Habees and Wu'eira, are located at the Nabatean city of Petra. Ajlun castle, west of Jerash in northern Jordan, is outstanding example of 12th Century Arab/Islamic military architecture. 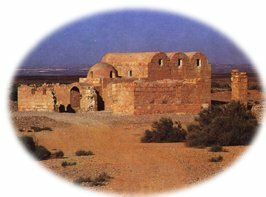 It was a base for Saladin in his successful campaign to drive the Crusaders from Jordan in 1189. Desert castles offer the fresco art and zodiac dome of Qasr Amra baths; fortress like enigmatic Qasr Kharanah; the Roman fort turned Umayade residential palace at Qasr el Hallabat; sprawling, brick vaulted Qasr Mushatta (so large it was never completed); the black basalt Roman/Medieval Islamic fort at Azraq; and massive, unfinished, fire baked brick Qasr tuba. What To Buy From Jordan?